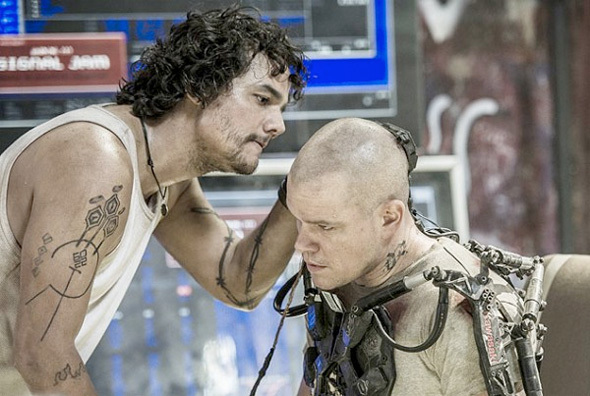 We've been waiting quite awhile for a better impression of Neill Blomkamp's follow-up to District 9, another original sci-fi film called Elysium. Last year's Comic-Con introduce audiences to some footage which impressed quite a bit, and we've seen a couple photos featuring Matt Damon and Sharlto Copley all decked out in technology. Now a couple more photos of Damon and co-star Alice Braga have surfaced with the promise of the first trailer finally debuting next Tuesday, which is the day after some sort of viral film footage event is taking place in a few locations. I love the combination of grit and future sci-fi technology in these photos. It seems like this could be yet another really special sci-fi film from Blomkamp. I can't wait. It looks so awesome. These pictures make it look so gritty and awesome. I don't know if there is a movie I'm more excited for right now. 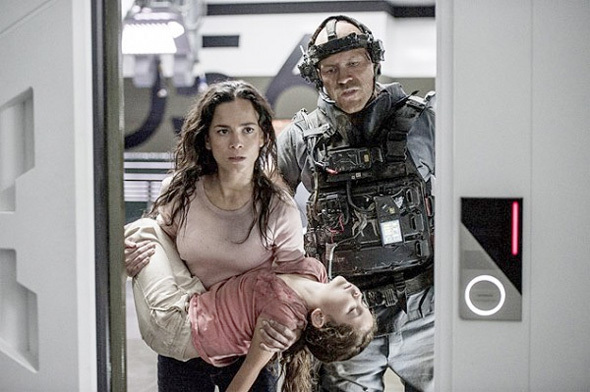 I have to say I REALLY can't stand Alice Braga, though. Im really looking forward to this, I just hope its doesnt get too preachy with social commentary and what not. Good sci-fi slides those themes in from the side and underneath without you being completely aware of it at the time. FANTASTIC sci fi movies slide those themes in, good ones are the ones that couldve been a lot better if they didnt suffer for being in your face about the writer/directors political standpoints. I Love Alice, she is awesome. Great cast by the way!!! Maybe a trailer might come out before August. Trailer is next week Tuesday, a day after some clips are shown in 4 different locations. Jesus, just give us a damn trailer already!! !